Russian Railways is launching a new passenger route between Moscow and St. Petersburg featuring two-storey rail cars. The first voyage will set off from St. Petersburg on Sunday evening. MOSCOW, January 31 (Sputnik) — A new St. Petersburg-Moscow passenger train route being introduced Sunday evening will feature bilevel (two-storey or 'double decker') rail cars, local media has reported. The new trains, featuring four person sleeping compartments with 64 passenger capacity (compared with the usual capacity of 36 persons) are also equipped with modern conveniences. These include comfortable sleeping places, roomier storage compartments, several power outlets, Wi-Fi, air conditioning, magnetic card-based locks, energy-saving windows and bright energy-saving LED lighting. The cars also feature satellite communications and navigations equipment. Steps to the second level are located at either end of the car. The train will include sleeping cars, a so-called staff car and a dining car. The staff car, with space for 50 passengers, is equipped with spaces for people with disabilities, including special spaces for the disabled and their carers, along with a wheelchair lift. The dining car, with room for up to 44 people at a time, features a six-cooker convection oven and a roomy freezer, allowing for meals to be cooked fresh right on the train. 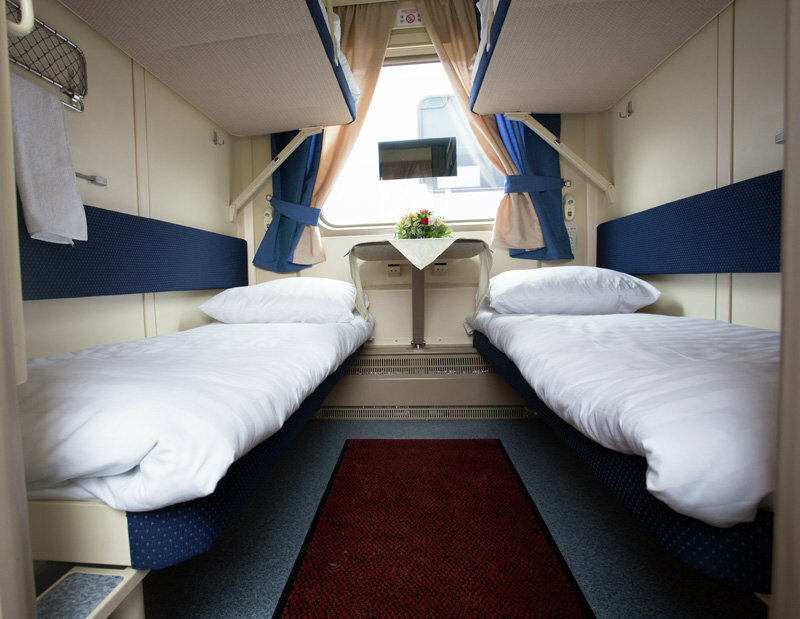 Sleeping places, four to a room in the sleeping car, in Tver Carriage Works' new double decker design. 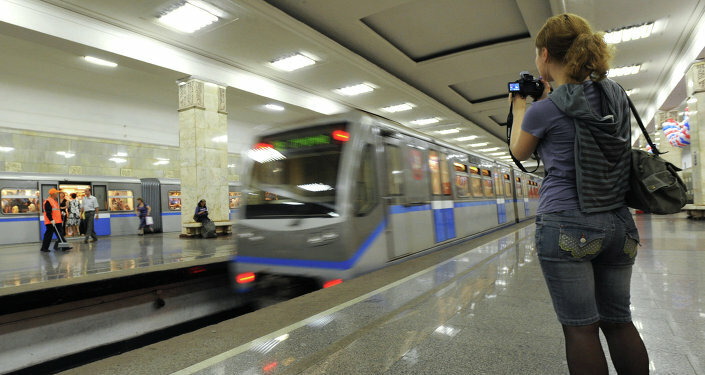 The trains are set to set off from St. Petersburg daily at 8:50 pm, arriving in Moscow around 7:00 am the next morning. The first train departing Sunday night from St. Petersburg will see a departure ceremony, with passengers being given special commemorative certificates to mark the event. Tickets for the new route, starting from 1299 rubles (about $20 US), sold out quickly, presumably out of interest in the new cars, designed by the Tver Carriage Works (TVZ), a holding of Transmashholding, for Russian Railways. The TVZ designs were first introduced in October, 2013 on the Moscow-Adler, Sochi route, in preparation for the 2014 Sochi Winter Olympics. Russian Railways purchased 50 of the double-decker cars in 2011, and is planning the purchase of dozens more for the St. Petersburg-Moscow, as well as for the Moscow-Kazan route to be introduced later this year, Kommersant explains. The company has also purchased cars for shorter distance routes featuring sitting places, including for the Moscow-Voronezh corridor. 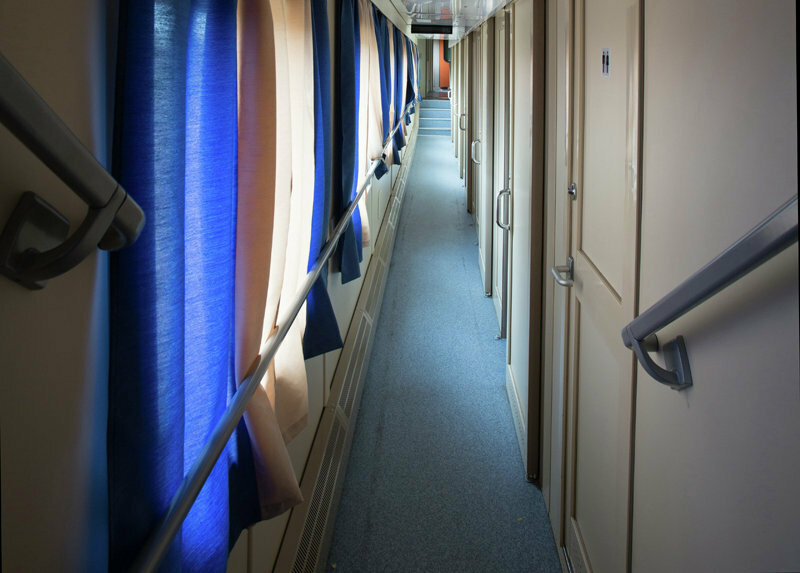 Business-class carriages in these trains will have 58 places, with 104 spaces in the economy class. Interior of Tver Carriage Works' new bilevel design. The new trains are part of a plan to reduce strain on the country's infrastructure of the most heavily used arteries. In addition to the double-decker train cars, Transmashholding has also signed agreements with Russian Railways subsidiaries on the creation of new, modern designs for electric trains for shorter distance intraregional travel.